Countless commentaries from world scholars and innumerable interpretations in all disciplines of art have not dulled the attraction of the ‘song of the dark Lord’ as the Gita Govinda of Jayadeva has been called. Odisha’s romance with the Gita Govinda is part of its cultural history, with several literary contributions on this kavya by Odiya and Sanskrit scholars of the State. The latest critical addition in this endeavour is a book in Oriya, “Sampoorna Geetagovinda” with not just a comprehensive introduction with variant readings, anvaya and word by word meanings and prose translation of Jayadeva’s poetry, but more importantly the music the ashtapadis and shlokas are devised in, with notations — all the handiwork of the author himself. Dr. Subas Pani’s fervent Jagannath devotion has made the Gita Govinda his bible and article of faith — the understanding and aesthetics of which have been relentlessly pursued, even through a career dealing with concerns of administration as a top bureaucrat. During a five-day event (this critic was present the first two days) organised by the Geetagovinda Pratishthan, the book release at the Rabindramandap in Bhubaneswar by the Chief Minister was followed by Odissi rendered to all the 24 ashtapadis, choreographed by established artists and presented by dancers of Orissa Dance Academy and Odissi Vision and Movement Centre, under the guidance of Pani and, more importantly, based on his music. Not a trained musician, Pani’s melodies are outpourings from the heart, evolving out of a deep emotional/intellectual involvement with the poetry, rather than with grammatically set ragas. The firm premise established by Pani himself of the total absence in his musical imagination of any classical background cuts out critiquing on the melodic part — which meanders between easily identifiable ragas from the Hindustani tradition and many ‘mishrans’ less easy to classify. The total musical effort had a superbly aesthetic rhythmic base, thanks to excellent mardal players Bijay Barik and Sachidananda Das — the soft touches and myriad hues of this percussion proving interventions in a variety of artistic/emotional tones. The regret is that the C sharp scale for the female voices made the singing very shrill in places, losing out on melodic sweetness. The mellow male voice of Roopak Kumar was good. The most treasured experience was provided by the excellent Sanskrit diction, never mangling Jayadeva’s muse with wrongly hyphenated words, and the linking up of words invariably done with respect for the meaning and emotional content. 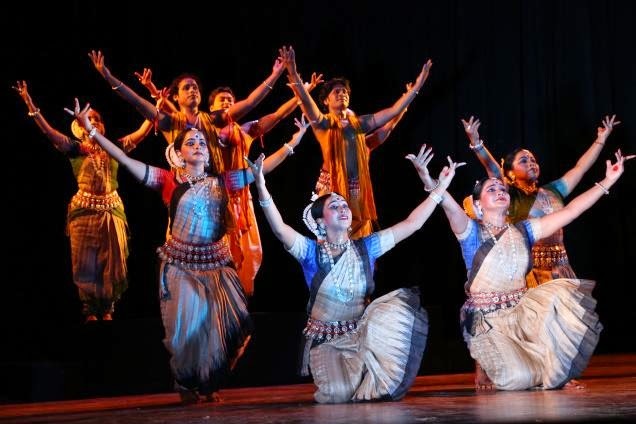 Amongst dance composers was Sharmila Biswas’ imaginative choreography of the Dasharupa Jagadisha embodying Krishna and Vishnu, with the “Jaya Jagadeheeshahare” chant, rendered by dancers of Orissa Dance Academy, making for a perfect opening. Another very original creation of Sharmila was for “Kapi Madhunipura” with Radha imagining Krishna making love to another, presented in a group version, the male dancer as Krishna with a joyous lilt to his dance, ideally catching the mercurial charm of the character. Sharmila’s choreography of “Kathita Samayepi” again was inimitable, again Radha’s soliloquising on being deceived yet again with her friend coming back without Krishna, visualised in group images. Under her visualisation was Saswati Ghedei Ghosh’s evocative presentation of “Rase Harimiha vihita vilasam”, the nostalgia of solitary Radha who in her mind’s eye sees the joyous spectacle of sporting Krishna with the cowherdesses, with the plaintive violin interventions for the “Viharati vane Radha” very moving. Sharmila’s solo rendition of “Sakhi he Keshi Mathanamudaram” was also intensely communicative in its underplayed aesthetics. The other senior choreographer was Aruna Mohanty whose unusual interpretation of “Madhave ma kuru manini manamaye” with the sakhi persuading Radha to join Krishna by getting over her wounded pride, saw a lot of juxtaposing in simultaneity of the scenes portraying Radha’s imagination as also the sakhi’s mollifying, well co-ordinated in the presentation by her finished disciples. It was Aruna’s choreography visualising repentant Krishna in “Mamiyam chalita vilokya” presented by Viswajit Das, the male dancer. “Pashyati dishi dishi” with the sakhi painting before Lord Krishna the pitiable condition of lovelorn Radha, in Aruna’s visualisation had two dancers, she and Madhusmita, moving between being Radha, and next watching the strangely abnormal behaviour of the love mad heroine from outside. Yet another of Aruna’s choreographic works in “Ramate Yamuna pulinavane”, with three dancers, portrayed Radha with simultaneous rendition of her mental images of Krishna dallying with another. Dancer Meera Das, very talented in her own right, did not attempt more than the orthodox solo presentation in “Nindati Chandana”, “Tave virahe vanamali” and “Ratisukha Sare”. “Krishnaya tubhyam namah”, the finale, was as worked out by late Gangadhar Pradhan, the guru who worked closely with Subas Pani creating very evocative group interpretations of Gita Govinda poetry. The beauty of spring, “Sarasa Basante”, instead of the usual Vasant raga, was set in Kedar (a raga very close to Krishna’S heart according to scholars present, quoting from myth). Late Gangadhar Pradhan’s choreography of this group visualisation was presented by disciples of Orissa Academy. The same guru’s choreography of “Çhandana charchita” provided the curtain raiser for the second evening, also rendered by disciples of Orissa Academy. In the review of the Sangam festival at Bhubaneswar titled “Letter, spirit and form”, the name of the Mohiniattam dancer was inadvertently mentioned as Sreerangam. The name of the dancer is Vinita Nedungadi, while Sreerangam is her organisation. The error is regretted.